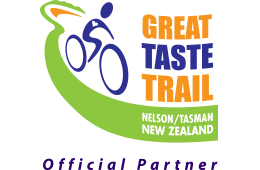 This full day tour is door-to-door from Nelson city & includes a wine cyclist transfer to the village of Brightwater, the first village on the Great Taste Trail Rail Route. Explore the flat wine country, riding self-guided on the trail & following our map – there are five wineries nearby which offer wine-tastings. Not all are open every day. Emergency support is included. Your day starts with your pick up in Nelson city for the transfer to our base (15 mins). At your briefing, we will then explain your route and the location of the wineries and other tasty places you can visit. Not all the wineries are open every day. We will then transfer you and your bikes to the village of Brightwater, the first village on the Great Taste Trail Rail Route, where you start your cycling. From here, you could cycle further on the trail to the next village of Wakefield (16 km return). For a gentler trip, explore Brightwater and relax at a cafe before starting the ride back to base through the wine country. The distance you cycle will depend up on the number of wineries you choose to visit. You should expect to cycle a minimum of 24km (between 2 and 3 hours on the bike-seat.) Wine-tastings at the vineyards cost around $5 for 3 tastes. Also on the wine tour route are cafes, a cheese shop, a berry garden and two craft breweries. Afternoon tea at a stylish brewery café is included in this package, so you can relax here at the end of the day before cycling the short distance back to our base for the 5pm shuttle back to Nelson. Electric bikes are a great option for this trip.